There’s a lot of competition out there among vacation rental properties and it’s not hard to guess what travelers cite first in terms of priority: location, location, and location. However, it’s not just about staying in close proximity to the major tourist attractions and hotspots. Guests also like to know a little bit about the neighborhood they’re staying in; where should they go to eat, drink, learn, and explore? As a vacation rental property owner, it’s in your best interest to share your favorite neighborhood spots with your guests. Check out these 4 reasons why you should be sharing local recommendations within your community and how to do it effectively. 1. You’ll help your guests feel like locals. Travelers who opt to rent apartments, homes, and private rooms are often interested in getting a local, insider-perspective on the city they’re visiting. After all, while hotels can be perfectly nice and comfortable, they don’t often paint an accurate picture of how locals live in a given city. Vacation rentals, on the other hand, often come equipped with comforts and amenities that help travelers to feel like they’re right at home. Take this feeling to the next level by offering your guests a guide to your neighborhood, including off-the-beaten-path suggestions, hidden gems, and local hangouts. If your rental property is located in a major tourist destination, it’s likely that your guests have heard of all the hottest bars, restaurants, and brunch spots. Show them the city from a new point of view by letting them know about the little cafe on the corner that makes a great cappuccino or the pizza parlor down the street that’s open all night long. 2. You’ll stand out as an authority (and get more business). Sharing your favorite neighborhood sights, attractions, and establishments doesn’t just help your guests – it can help your rental business, too. By sharing insider tips like upcoming festivals and events, peak visiting hours (or hours to avoid), little known facts, and secret menu items, you’ll stand out as an authority among the countless other rental options in your area. If your rental property is located in the same neighborhood and price range as a competing property but your listing is filled with local tips, photos, and ideas for exploring, travelers are much more likely to choose your listing. After all, who doesn’t want to be hosted by an authority on the local neighborhood? 3. You’ll help support and grow your local community. Those mom and pop shops, family-owned restaurants, and other local prizes are what give your neighborhood its unique charm, right? By sharing your top recommendations with your vacation rental guests, you’ll help give back by promoting, supporting, and growing the small businesses in your local community. In large cities that are also popular tourist destinations, there’s a lot of competition among restaurant and other business owners, and it can be easy for the smaller guys to get looked over and forgotten. 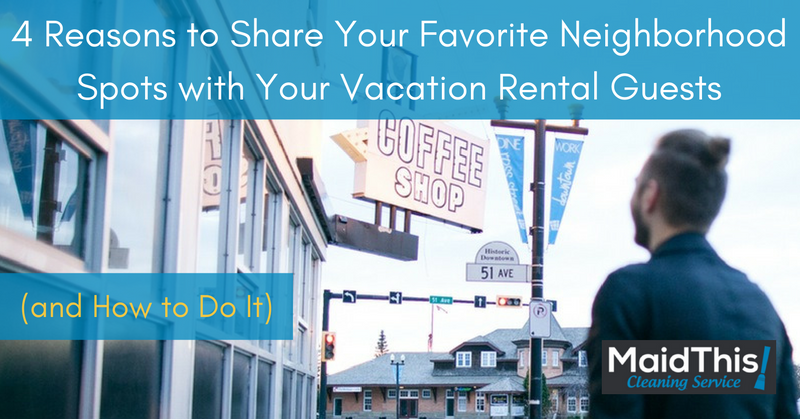 By pointing your vacation rental guests towards the neighborhood establishments you know and love, you’ll be making sure they have a great time and helping small local businesses stay afloat. 4. You’ll receive better reviews. Vacation rental owners who go above and beyond in their hosting duties always tend to do better in terms of receiving both 1) a greater number of reviews, and 2) more positive reviews. Sharing your favorite neighborhood spots with your guests is yet another way to exceed their expectations and ensure they have a fabulous time in your rental property (and that they write about it online afterwards). After all, the highlight of their trip could be all thanks to your recommendations! How great would it feel to know that your guest had the best meal of their whole trip at the restaurant you recommended or that they enjoyed the small art gallery you mentioned even more than the top-rated museum in the city? Better yet, what if that guest posted about their amazing experience online and that review brought in a whole new wave of business for your property? That’s the power of positive guest reviews! Include information directly in your listing. One of the easiest ways to share your favorite local hotspots is by simply including it in your listing. Many rental sites like Airbnb offer a designated space for writing about your property’s neighborhood. Use this section to paint a picture of your neighborhood in general and call out interesting tidbits (i.e. “We’ve got more museums than any other neighborhood in New York City” or “If dive bars and antique shopping sounds like your idea of a good time, this is the neighborhood for you!”) and give a shout out to specific favorites. Leave a binder. Many vacation rental owners leave behind a binder or folder filled with helpful tips for their guests, such as checkout procedures or how to use certain appliances. This is a smart idea, but take it up a notch by including a brief welcome letter and a list of all of your favorite local restaurants, cafes, bars, sights, and attractions. This can be especially helpful for guests on the day they check in as they’re often tired, hungry, and not in the mood for venturing too far from home. Send an email. Similarly, you can save some paper and simply send guests an email with all of your local suggestions. As soon as your renters have confirmed their booking, send them a message that outlines all of your neighborhood recommendations. Build a website. For vacation rental property owners who are really looking to take their marketing strategies to the next level, a personalized property website can really make your listing stand out. One Airbnb host did just that and now uses her property’s website to highlight her neighborhood’s best qualities and hidden charms. In fact, she has an entire section dedicated to upcoming festivals, art showings, performances, and other events, as well as new ideas for dining and exploring. Create a digital guidebook. Help your guests discover what you love about your neighborhood by sharing your guidebook before they get there. Sending a guidebook in advance will also help decrease unnecessary questions like directions, check-in details, parking, etc. This way, your guests will arrive with better questions and will make more informed decisions about what they want to do during their stay. Plus your hospitality appearance will be more modern and professional. Sharing your favorite neighborhood spots with your vacation rental guests can mean good things for you, your guests, and your local community. Use one or more of the tips listed above to help make your property listing shine! Need help making sure your vacation rental is in tip-top shape for your guests? Schedule your next MaidThis! appointment today!